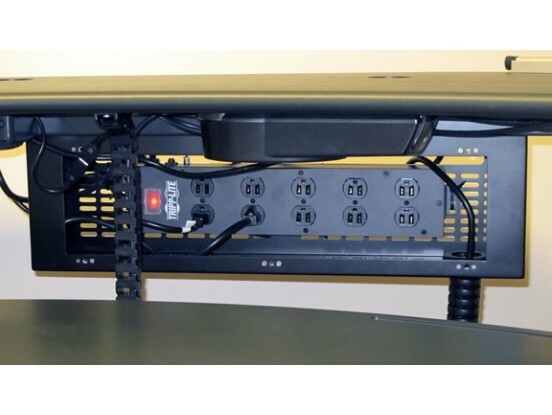 CableCab mounts under the rear surface of Biomorph tables to absorb, organize and hide unsightly cables, power blocks etc.Includes a heavy-duty 10 outlet Tripplite power strip with surge-protection and protected switch. 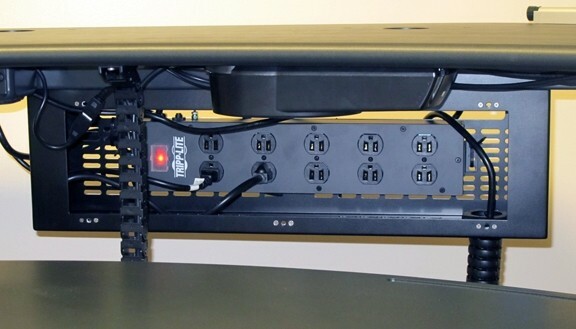 Made from sturdy but lightweight perforated aluminum, it is positioned to allow easy access from the front of the table, with a removable access panel with 1/4 turn thumbscrews and multiple access ports on 3 sides it allows monitors and other IT items to plug directly into the power strip within through our surface cable grommets, and only power and data cables leave the cabinet through the included heavy-duty cable spine, for a clean and uncluttered look. Fits all Plus Series tables, Level2Plus tables, Level3Plus tables, Flexo Level3 Series, Maxo Series tables. Retro-fittable. Size: 28"W x 6"D x 11"H .